Over millions of years fish, like all other forms of life, have adapted themselves to certain feeding methods and forms of nourishment which are available in sufficient quantities in their natural habitat. Only in very rare cases do aquarium fish find adequate quantities of any one type of feed in their tank without our assistance. One of the most important and interesting tasks of an aquarium keeper is to feed the fish in a healthy and sensible manner as well as to consider the environmental conditions. It is not only a question of feeding fish sufficient quantities of just any feedstuff. It is most important that the special feeding requirements of the "water babies" are met as closely as possible. 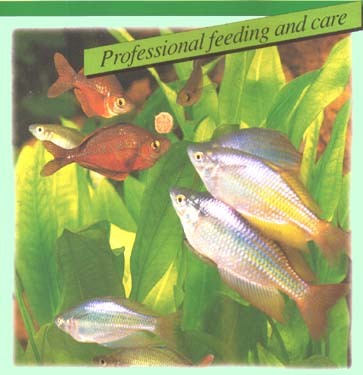 This brochure explains the significance of species specific feeding and shows you how to provide healthy and varied feeds which specifically meet the needs of your aquarium fish using the wide range of JBL fish food.